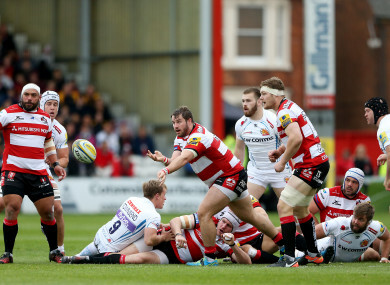 McAllister gets a pass away for Gloucester against Exeter last season. CONNACHT HAVE TODAY announced their first signing for next season with the unveiling of loosehead prop Paddy McAllister from Premiership side Gloucester. The prop will be 30 when he arrives in Galway after four years under David Humphreys in Gloucester. He played 57 times for the Cherry and Whites after cutting his teeth in his native Ulster with 44 appearances before moving on to Aurillac. “Paddy is a powerful scrummager and strong ball carrier,” said Connacht forwards coach Jimmy Duffy today. Email “Connacht sign ex-Ulster prop Paddy McAllister from Gloucester”. Feedback on “Connacht sign ex-Ulster prop Paddy McAllister from Gloucester”.